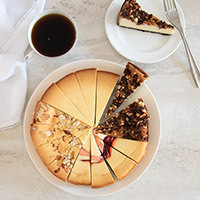 We love baked goods...and we know the people in your life do, too! That's why we created this “Baked Goods Premium” gift basket, which is full of some of our favorite gourmet desserts. Inside one of our exclusive baskets we've united an assortment of tempting treats, like rich, dreamy brownies and crisp peanut butter cookies, making it perfect either as a gift or for entertaining guests! (2) Fudge Walnut Brownies - 1.5 oz. (2) Chocolate Chunk Brownies - 1.5 oz. (1) Peanut Butter Brownie - 1.5 oz. (2) Chocolate Chip Brownies - 1.5 oz. 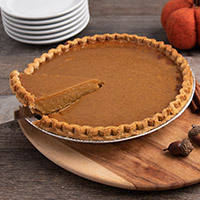 (1) Butterscotch Blondie - 1.5 oz. (1) Oatmeal Raisin Cookies (2 pack) - 2 oz. (1) Peanut Butter Cookies (2 pack) - 2 oz. (2) Chocolate Chip Cookies (2 pack) - 2 oz. (1) Fudge Brownie Cookies (2 pack) - 2 oz. (1) Lemon Sugar Cookies (2 pack) - 2 oz. (1) Pecan Sandy Cookies (2 pack) - 2 oz. I can always depend on Gourmet Gift Baskets to arrive on the date specified and in good condition. My son loved the brownies and cookies. I bought baked goods arrangements for six individuals as holiday gifts. Without exception, the recipients described the items as fresh, delicious, and timely. The recipients called and were thrilled with the gift basket. The basket was very nice! Had a great assortment of cookies. Sent a gift basket for Thanksgiving. Sister said the cookies were soft and chewy. She loved it! I ordered an assorted cookie/brownie basket for a friend who is convalescing from an injury. I can't believe how quickly it was delivered..and in fantastic condition, too. She raved about the assortment and the quality of the products. I will definitely call upon Gourmet Gift Baskets again in the future! I bought this in Early July, for an open house. Everyone loves ved them! My husband got this as a gift while in the hospital. He says they are the best cookies and brownies he has had. He will not share with us. They’re are all his. I have bought this basket at least 4 times and have received it! It is delicious and looks pretty. Perfect to pick at goodies, to add a little smile to a bad day. I purchased this for a very dear friend of mine who was turning 80 years old. She was totally surprised and in awe of everything in the basket! She loved it and I am so glad I found your website! I have purchased many different types of baskets from Gourmet Gift Baskets and have never been disappointed! The recipients have all been very happy with each and every gift basket I have sent! The cookies and brownies taste so good! I had to try them all. The basket that it came in is so cute. I liked how the treats are individually wrapped for freshness. I bought this for my boyfriend's birthday. It was delivered on time and waiting for him on his birthday when he got home from work. He was delighted as to how many baked goodies there were. He said every thing was fresh and delicious! I was very happy that he enjoyed his basket of baked goodies! What a great selection of cookies and brownies! They were not only a tasty treat but were packaged in such a thoughtful way. Each selection of cookie was individually wrapped and labeled. There was no guessing as to what you picked. A nutrition guide described the ingredients and nutrition for the different types. Once again, no guessing! What a thoughtful way to package an edible gift. The recipient absolutely LOVED this basket of deliciousness!! As always the it was received without a hitch, as scheduled. LOVE GourmetGiftBaskets. Definitely my go to for a gift and/or pick me up! Very easy to order, and the gift basket was exactly as expected and enjoyed by all. I bought ths for a family out of state as a thank you, but they enjoyed the treats very much. Each treat was individually wrapped. 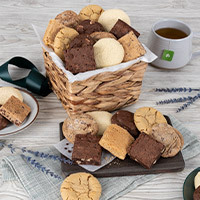 Our Firm sent the cookie baked goods basket to a very important team of people that we work closely with and they told us that the cookies were very good and that the brownies were melt in your mouth delicious. We will send this again. I live in Finland and used this service to send a birthday gift to my sister living in NY. She was really happy and said they were all delicious. The basket arrived one day earlier than the selected date though. Would preferred if it arrived on the birthday day. Specially with these delivery costs. We surprised our daughter and husband with a GourmetGiftBasket for a special occasion. They loved it! My aunt sent me the gift basket as a gift, the cookies and brownies were just right it was not too sweet, they were tasty and delicious! I have bought this basket for several people and it is AMAZING everything in it is like its homemade. I sent to someone and they enjoyed the basket!!! Will send another to my sisters. The cookies in the picture look good enough to eat. According to my client, they were!! Terrific gift!! Thanks, Gourmet!!! I sent this to my boyfriend. And he absolutely loved them. He said they were the best brownies he had ever tasted. And his family thought the same. I had seen horrible reviews else where but I'm glad I tried them out. this was sent as a sympathy basket to take on the road to travel to meet family and it was a blessing for the travelers and enjoyed the way it was packaged. I had bought this basket for Valentine's Day for my fiancé. He absolutely loved it! Perfect for any occasion. I bought it for my husband for Valentines Day because he has a sweet tooth and he liked the first item he tried. I also tried a brownie and it was very fresh and I am pleased with the quality. I do wish there were choices of what can be put in the baskets. Great products! Made an awesome Valentines Day present! But would be great for any occasion! Ordered for Valentine's Day for my husband. He LOVED it. Says everything he's tried out of it so far is delicious! I sent this to my mom and her husband who live in Florida to share with my sister and her family who flew down to spend the holidays with them. Mom said everything tasted wonderful. Friend that I sent this too, said that the cookies are out of this world, so fresh. Great gift. 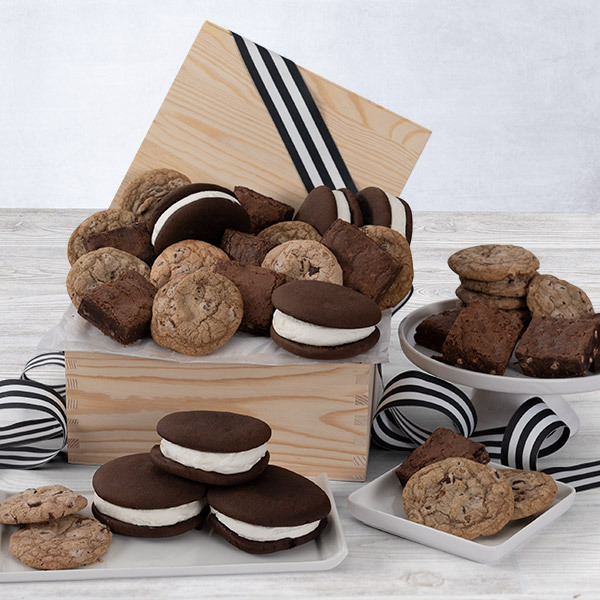 We received this as a gift and were pleasantly surprised by the deliciousness of each cookie and brownie type. I'd certainly consider purchasing/sending the basket to other friends and family. Thanks! The basked was well received but it arrived WAY earlier than it was supposed to, so they were out of treats a week before Thanksgiving. I got this for the people in my office to thank them for a great summer. The treats were fresh and everyone LOVED them. This was a great simply wrapped "get well" purchase for a male friend who recently had back surgery and is in the recovery phase. He loved the freshly baked goods! I will purchase from here in the near future! I bought this for my son-in-law for Father's Day. I didn't see the basket but my daughter said he loved it (and the kids). She also said the basket itself was a keeper. It was delivered in the time frame estimated. All in all I would order again. I purchased this for my Dad for his birthday a week ago. He loved it ! I sent this to my nephew for his birthday who loves all kinds of cookies and brownies and he just loved it. All the items where very fresh and packaged very well. Good quality baked goods. He was very happy with everything in this basket. Ordered this for a co worker and it arrived on time and she loved it. My family loved this basket and it was delivered exactly when promised for Easter. Thanks! I ordered this basket for a long-time friend who had just lost her mother. I wanted to remind her that there is still sweetness in the world. She was delighted with the basket and reported to me that the cookies were "Delicious!" Thank you for providing a good product at a good price, delivered on time. I bought the basket for my husband for Valentine's Day and he loved it!!! I wasw completely satisfied with the service and quality of the product. I needed a last minute gift shipped. GourmetgiftBaskets came through. gift arrived Christmas eve. I purchased the gift basket as a corporate gift to thank the company for their yearly services. The respond I received from them was: They were very good the cookies were nice and soft tasted amazing!! The brownies weren’t dry everything was delicious!! They tasted fresh. I had to tell Bill to stop coming back for more! everyone really enjoyed them it was a great treat! OH! and the basket was beautiful I actually kept that and took it home.  Thanks again! I had a gift basket sent to some friends. They were raving about it when they received it. Fresh, quick delivery. Best oatmeal cookies I ever tasted! Sweet gift for the sweet people in your life. I sent this to my son for his 19th birthday. He said everyone loved them cookies! Thank you!